With the likes of Kale relocating to Causeway Bay and the sad closure of Home: Eat To Live, Central and Sheung Wan are suddenly down decent vegetarian options. Doing its bit to fill the gap is Veggi Monster, a brand new hole-in-the-wall vegan joint tucked off of Wing Lok Street. The menu is small – just a couple of burgers and wraps plus desserts and daily salads. 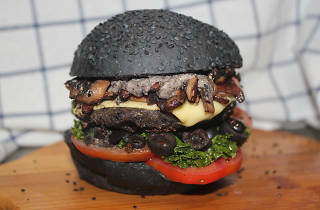 We order the Burger in Black ($78), a sizeable organic black bean and quinoa burger topped with melted non-dairy cheese, portobello mushrooms, truffle sauce, kale and tomato sandwiched between a charcoal bun. The bun is fluffy but solid enough to confidently cradle the fillings. The patty has an overpowering flavour that crowds out the truffle sauce, but the playful textures and crunch provided by the kale mean we don’t miss our beef. It’s a decent veggie burger – not the best we’ve had and though it leaves us with unattractive black bits in our teeth, it does the job. We also grab a wrap ($55) filled with lion’s mane mushroom, quinoa, mixed greens, almond slices, tomato and vegan salad sauce. Decidedly average, whatever ‘vegan salad sauce’ is, it’s way too fruity and the mushrooms are a little squeaky on our teeth. Though it makes for a serviceable snack, we plan to stick with the burgers in the future. Veggi Monster won’t be giving the crew at Mana many sleepless nights but taken as a tiny, reasonably-priced operation for grabbing a healthy bite on the go, it’s good enough. Oh, and they sell metal straws with cleaning brushes for $30, so they get a big thumbs up for being eco-conscious.